Once there was a slick sailor he always knew what to say when ladies were around. He would often talk about his scary and action packed adventures on the high seas. When he wasn't telling his tales, he was cutting a rug. Well, dancing not installing carpeting, however he has done that in the past. That sailor had all the luck in the world. 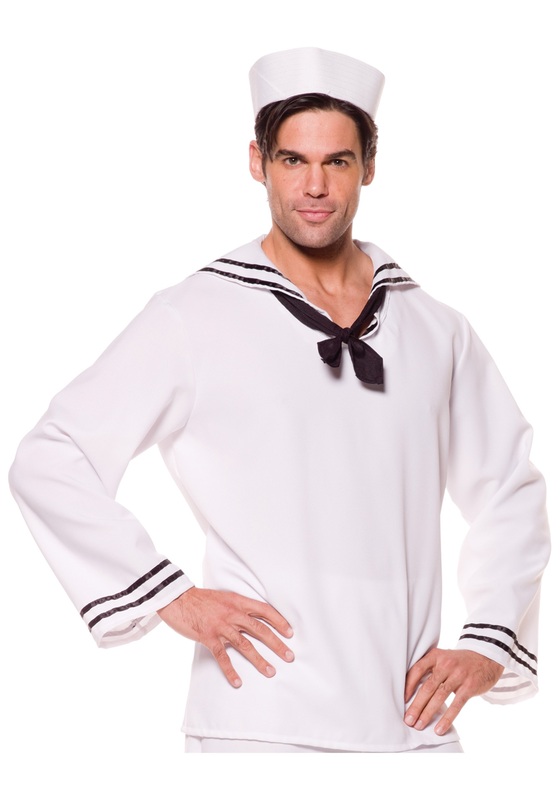 You can be like him in the Plus Size Sailor Shirt. The charming Sailor Shirt is 100 percent polyester with a classic sailor collar. Black satin adorns the collar and cuffs for a polished look. The costume includes a black neck scarf and white sailor hat to really impress the ladies. Practice your sea shanties because you'll be sweetly singing them at your next Halloween Party.